As with most hobby and how-to magazines, QST has had a long-running monthly column featuring handy tips from readers and sometimes from the column editor's (currently Steve Sant Andrea) own experiences. It has taken various names over the years such as "Gimmicks and Gadgets" and now "Hints & Kinks." This installment from the December 1966 QST presents a short introduction to a VHF 'Lazy-H' antenna for mounting in the attic (outdoor restrictions were common even half a century ago). It is of simple construction using lamp cord in the configuration and element lengths given - still useful in 2013. Getting an indoor antenna to perform satisfactorily is not always easy. Certain sacrifices will result from any attempt to install an indoor antenna. Yet, by taking advantage of broadband antennas and effecting the best possible impedance match to them, worthwhile results can be secured from an "attic special." The 2-meter Lazy H described in this article is an old standby which should bring back a few nostalgic memories to 10- and 20-meter operators who have dabbled with combinations such as this. The entire system, including 40 feet of 300-ohm ribbon line, cost the author less than two dollars. It took about 45 minutes to cut the wire to length, tack the system to the attic wall, and adjust the matching transformer for an s.w.r. of 1:1. At optimum efficiency this antenna theoretically should be capable of a maximum gain (bidirectional) of about 5.9 decibels. The overall efficiency will be governed by the placement of the array with respect to house wiring, water pipes, gutters and downspouts. The antenna should be kept as far away from such things as possible, to lessen the chance of pattern distortion, detuning effects, and absorption of the signal. Of any number of simple indoor antennas tried for operation on 6 and 2 meters, the Lazy-H has been superior to all others used. A 10-foot length of a.c. zip cord was used for the W1CER Lazy-H. The cord was split at one end and the two conductors were pulled apart, making two 10-foot lengths of insulated wire. Each wire was pruned to a length of 115.5 inches and pinned to the attic wall in the configuration shown in Fig. 1, so that their center sections B-B, crossed. A piece of cardboard, 3 1/2 inches square, was used as a spacer at the point where the two are transposed, permitting uniform spacing to be maintained between the phasing line. The insulation was stripped from the wires at the points marked X, permitting the matching transformer to be soldered into place. The matching transformer was fashioned from a 20-inch length of 450-ohm open-wire line. A Transmatch1 is used at the author's station for coupling the v.h.f. equipment to the 300-ohm transmission lines which feed the antennas. Initial tests were made by terminating the transmission line with a 300-ohm noninductive resistor and applying a few watts of transmitter output power to the line through an s.w.r. bridge. The Transmatch was adjusted for a 1:1 s.w.r. reading and the dial settings were noted on paper. Next, the terminating resistor was removed and that end of the feed line was tapped along T1, experimentally, until a 1:1 match was obtained at the same setting of the Transmatch controls that gave a 1:1 match with the 300-ohm termination. The dimensions given in Fig. 1 should be well within the "ball park" and should provide a close match at 145 Mc. The matching transformer should be adjusted for your favorite portion of the band. Frequency excursions to other parts of the band will be possible, but the s.w.r. will rise somewhat as you depart from the part of the band to which T1 has been tuned. The Transmatch will permit matching the transmitter to the line and will disguise the slight mismatch at "off" frequencies, enabling the transmitter to load up normally. 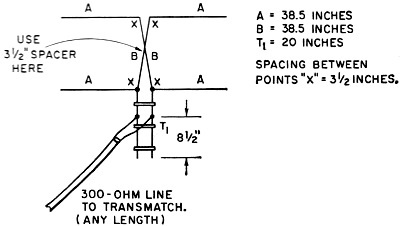 If coax line is preferred, a balun transformer1 can be attached to T1 in place of the 300-ohm transmission line after the system has been tuned as just described. This will permit the use of 75-ohm coaxial line, if desired. Since the Lazy-H is a bidirectional array, it should be oriented for maximum radiation in your favorite direction. In the author's case, north-south directivity was desired so the array was tacked to the south wall of the attic. Although maximum radiation is at right angles to the plane of the antenna, some side response exists, making it possible to work in all directions but with reduced efficiency off the ends of the antenna. center sections, B, are transposed as shown. During an hour of casual listening with an SR-42 transceiver, several W2 stations in New York and New Jersey were copied Q5 while using the Lazy-H. Stations as far north as Massachusetts were also received well above the noise level of the receiver. Many of the stations heard were more than 100 miles away, offering proof that the antenna was performing satisfactorily. 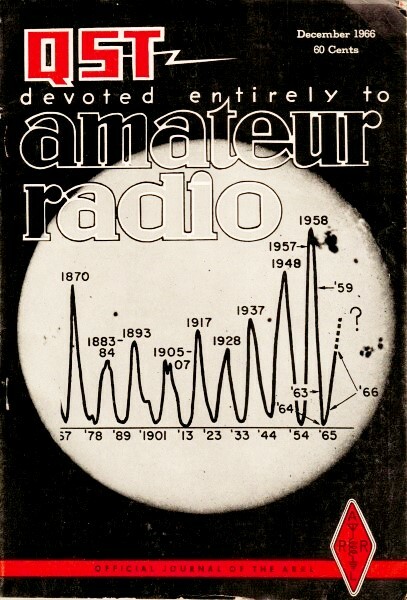 1 The Radio Amateur's V.H.F. Manual, pp. 188-189.